The next course begins May 7, 2019. Register here or email Carissa Sheehan. Mobile is a tsunami, learn how to ride the wave! If you go to the largest city or the darkest jungle, the people you meet are likely to have a mobile phone. Most of us have anxiety when separated from our mobile devices. The fear of not having your phone now has an official classification - nomophobia (no mobile phobia)! Mobile’s ubiquity and growing capabilities offer an amazing ministry opportunity! Mobile represents the most important technology available for kingdom advancement today for individuals and organizations alike. Mobile trend expert Tomi Ahonen recently stated "it's time to double your efforts using mobile." If you are just getting started (or don't know where to start), this course is perfect for you. Why Use Mobiles in Missions? Whether a feature phone or a smartphone, the majority of web use now happens on mobile phone screens. Too few Christians and ministries leverage the opportunities that this device provides their outreach. 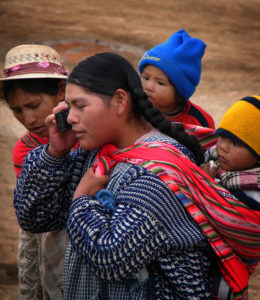 Hundreds of millions of unreached people have access to the digital world for the first time. What will they find? As followers of Christ we have the chance to offer the hope and freedom found in Christ. We define mobile ministry as the use of mobile technology to fulfill the Great Commission and the Great Commandment. By the way, for us mobile technology is mobile phones (feature phones and smartphones) and the tablets. Field worker and want to see your ministry accelerated through the use of mobile phones and new media. Great Commission Christian living in an unreached area. Missions media practitioner and want to sharpen your skills, get inspired by new ideas, make new connections, find collaborative opportunities and mentoring. Leader in a missions organization, church or ministry seeking to be more effective at reaching and teaching people for Christ. Using Mobile Phones in Missions is a five-week course that will increase your ministry’s effectiveness by engaging the lost through their mobile device. Each participant will learn to assess the media situation of their target audience, identify opportunities for using their mobile device and implement an appropriate media outreach. Insight and inspiration on how God is using the mobile revolution as the most recent "Roman road" for the Gospel. Foundational training in using your mobile device in ministry (evangelism, discipleship, church planting). Connections with expert instructors and like minded peers around the world. Culturally and technologically appropriate mobile tools and techniques for your ministry environment. Practice in developing media for your own ministry context. Resources to provide you further direction after the course. Be prayed for each week by a dedicated prayer partner. The student will be introduced to the 3 W's of media ministry. The student will be introduced to the ten unique benefits of mobile. The student will understand the rationale for mobile ministry in mission's settings. The student will learn the major mobile tools available for ministry. The student will understand the core concepts of appropriate technology in media ministry. The student will be introduced to orality concepts and the opportunities mobile ministry provides. The student will understand security concerns related to mobile ministry and know how to carry out a security risk assessment. The student will learn how mobile technologies can be used for ministry in offline and security-restricted settings. The student will learn how telephone-connection mobile technologies (voice, SMS, MMS, and USSD) can be used in outreach. The student will be introduced to three ways to use social media in ministry. The student will learn how to choose the most appropriate social media platform for ministry according to their target audience and ministry goals. The student will conduct a social media analysis of their target audience. The student will analyze the main types of mobile phones in use among their target audience. The student will conduct a website assessment to determine its appropriateness for use in ministry among a target audience. The student will be introduced to the trends, tools and platforms in app development most suited for mission settings. The student will learn their target population's app usage patterns. The student will assess the availability of ministry apps that can be used among their target population. The student will be introduced to media empowerment concepts and their potential for ministry impact. The student will be introduced to concepts and practices that increase the impact of self-produced media. The student will learn mobile-specific tools and practices that enable mobile users to produce high quality images, audio and video recordings. A five-week, mentored experience beginning Tuesday, May 7, 2019. Each live session will be on Tuesday at 7:00 a.m. Pacific Standard Time (GMT -7.00, use this time zone converter). Live course dates: May 7, May 14, May 21, May 28, June 4. Live sessions will be recorded for later review. To receive the course certificate, attendance at four live sessions is required. An additional "early registration" discount of $20 is available to those who register and pay by April 16, 2018 (three weeks before the course start date). For example, if you qualify for the standard registration of $240 but register with a teammate and register by April 16, your cost would be $180 per person. Registration: Here is the registration page where you can register for this course and make your payment. You will then receive a link to the classroom course. You will receive a charge on your credit card from Visual Story International. Keith Williams - Keith is the director of Mobile Advance (www.mobileadvance.org), an initiative of WEC International. Keith has assisted in the implementation of mobile ministry initiatives in more than 35 countries and has helped in the development, testing and promotion of various innovative mobile ministry approaches. Keith previously served ten years as a missionary and team leader in the Arab world. Jill McKinnon - Jill has worked in Chad with WEC International for twenty years and is currently located in France. During her time in Chad she began a literacy project among nomadic Arabs, when not teaching she loved to be out in the market place selling Christian literature and sharing the Gospel with people. In a land with very poor literacy levels there was not a huge demand for the written Word, although it is highly respected. As mobile phones came into Chad it revolutionized the opportunities and the scope for sharing the Gospel message with people who would eagerly watch and share videos and audio files. Recently there have been opportunities to train national workers and to help them overcome the fear and barriers involved in reaching out to their neighbours.